Planning a night out? Are you looking for some fun? If you are visiting Plaistow, NH, you should check out our night club. 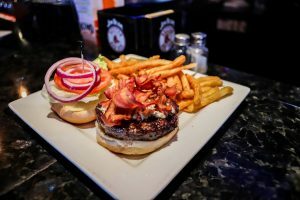 Crows Nest Pub and Grill is the best place in which to enjoy a fun night out with your friends! We run a fantastic bar and grill with all of the features you’d expect, including live entertainment and karaoke. Going here is the perfect way to meet new people or to bring old friends and reunite, particularly if you visit during happy hour. Our bartenders are friendly and our service is quick! Once you’ve had some of our fine food and drink, you might want to stretch your legs on the dance floor. Our lounge hosts some of the best dancing in the area, complete with great atmosphere and fantastic music. Finding the best bar & grill in Plaistow, NH means it should have music and great company. 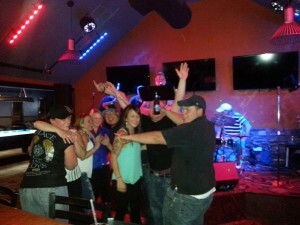 At Crows Nest Pub and Grill, we even let you make your own music on our karaoke nights! This is a great way to show off your stuff and have fun with friends. With excellent service offering you delicious food, it only makes sense to offer great opportunities for entertainment and socializing. We want our visitors to enjoy their favorite drinks with our full bar service and then dance the night away with great live entertainment! There’s no better time to visit us than during happy hour! You’ll be able to get great discounts on our food and drink. There’s no better way to enjoy a night out on town than enjoying fine beverages with good friends. We run a thriving night club, so this is a great chance to meet new people, including prospective romantic partners. These traits are why our establishment has become the place to hang out in Plaistow, NH. Finding the best lounge in Plaistow, NH means it should have entertainment and great company. 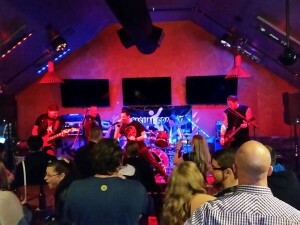 At Crows Nest Pub and Grill, we offer live music from some of the hottest bands in the area! Canned music from loudspeakers just can’t compare to the real thing. With excellent service offering you fun cocktails, live performers are the perfect accompaniment for a fun night. We want our visitors to enjoy their favorite drinks and then dance the night away with great music! You can even participate in karaoke! Dancing has existed for as long as there have been humans. This is one of the best kinds of social venues for meeting new people, and having fun. Not only that, but it also makes for some great exercise. Our night club has plenty of room for those who want to dance. Making things even more exciting is the fact that we often have live entertainment playing the hottest dance tunes. There’s no better way in which to enjoy your night. 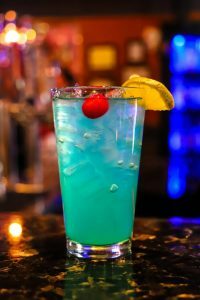 As a popular local saloon in Plaistow, NH, we make sure that you can relax in style while enjoying great food and drink. After a long day after work, you can have a drink in your hand and have complete freedom at our lounge. Meeting new people and enjoying drinks will make all your worries go away. If you’ve had your fill of cocktails, you can check out the dance floor. This is a great way to have fun, and maybe even meet that special someone. All these can add up to a truly unforgettable evening.